Gold Trophy compares favourably to Golden Tour but it’s not really what we would call state of the art. It’s certainly popular though and perhaps it’s simplicity is what makes it attractive. There are five reels and nine paylines and, aside from the standard playing card symbols, a whole host of golf-related icons.We’ve never been completely convinced that golf should be considered as a sport; it’s more of a stroll with some small bursts of activity along the way. Still, a lot of people like it and an online slot based on golf is always welcome – this one’s from Play N Go and the only other one we’ve encountered is Playtech’s Golden Tour. We have a driver and ball, a golf cart, a gold winner’s jacket, a flag/hole and a golf ball with a gold trophy logo. There’s also a gold trophy wild symbol and a ‘1st place’ ticket which activates the free spins. Land three, four or five of the 1st place tickets anywhere on the reels and you will win between ten and twenty five free spins. Initially you will be shown three overturned tickets – click one and it will reveal the number of free spins awarded. The spins will start automatically and the reels spin so quickly it’s all over before you know it, hopefully winning you some money along the way. All wins during this feature will be tripled and it’s also possible to trigger more spins while you’re within this round. Win with a gold trophy wild and it’s worth 6x the prize. It’s possible to gamble each win you land, including the total free spins win, by clicking the ‘Gamble’ button underneath the reels. You will be taken to a screen showing a an overturned playing card and asked to choose whether it’s red or black (for 2x your win) or pick the correct suit (for 4x your win). There’s a maximum limit of five correct successive guesses or 2500 coins. Lose and you’ll be back in the base game with no win. Play with the maximum lines to try and trigger the free spins round; if you’re tempted to gamble your winnings, don’t count on getting more than one or two successive wins. 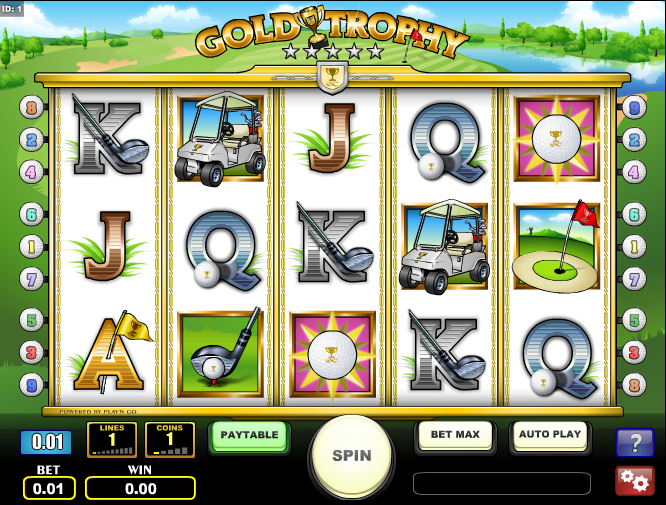 Gold Trophy is a fairly simple but fun slot which clips along briskly; the sound effects are good – each reel stops with the sound of a golf club hitting a ball – and you won’t regret a few minutes spent playing this slot.